To give you a sense of the stupendous scale of William Kentridge’s The Head & the Load at the Park Avenue Armory: I watched it, rapt, for an hour and a half, and I completely missed an entire marching band and a set piece the size of a baby elephant. In the final moments of the opera, which takes place on a broad stage that occupies a fifth of the Armory’s four-acre footprint, the company trudges in line past us—a massive exodus of men, women and materiel. This is appropriate, since Kentridge’s subject is the countless East and West Africans pressed into service as “carriers” during the Age of Empire, as well as the unheralded African soldiers who fought and died in the Great War. I would swear that some of the people and objects in the final parade had never been onstage before, but The Head & the Load is itself a work of muchness and overburden. Maybe at some point my ravished brain just couldn’t take it all in. 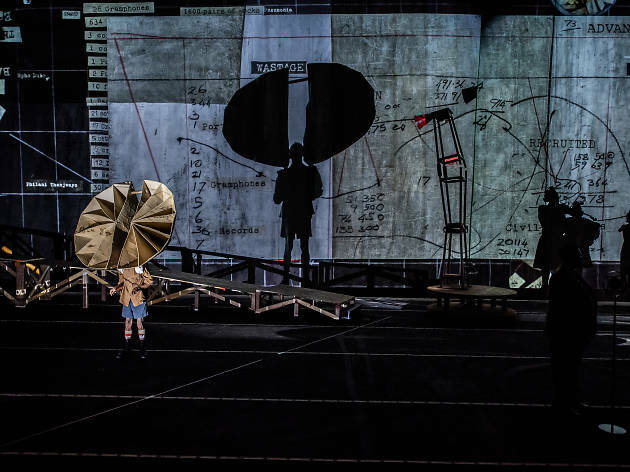 Kentridge’s maker-model is the Dadaist Kurt Schwitters, so the night is a flurry of images, clippings—he draws text from diaries, a military drill handbook, and bits of Aimé Césaire and Tristan Tzara—and sudden poor-theater surprises. I cannot count the number of languages we hear; some of the shouted, sung and chanted dialogues are translated, some are not. For a work that’s about giving credit where it’s due, the show does not make it easy to figure out who’s responsible for what. Do we praise composer Philip Miller for juxtaposing lush Romantic music with songs in Swahili and isiZulu? Or should that bow belong to co-composer Thuthuka Sibisi? In either case, the frenzy of beautiful noise has been exquisitely orchestrated to overwhelm us without any obvious sonic assault. Against a giant projection screen, which shows archival footage and vivid shadow play, a thousand things go on. Mncedisi Shabangu reads from a small notebook (“From Uganda, 195,000 carriers!”); soprano Grace Magubane starts a terrifying song that sounds like the wail of an air-raid siren; South African superdiva Ann Masina glides from bel canto into call-and-response language lessons and back again. The piece is meant to impart the devastation of the “scramble for Africa,” but it’s also full of jokes: A massive packing case falls apart to reveal a fez-topped orchestra tootling away, and a woman with a Lotte Lenya haircut screams in German as a dancer pushes her across the stage—the shrill Imperial boulder for some unlucky Togoland Sisyphus. On every level, The Head & the Load is a feast. Across Sabine Theunissen’s huge set, tin and wood objects pivot and swing. Everything is outsize; there’s a stunning metal megaphone that’s 12 feet tall and a knock-kneed tower that is part steampunk and part Dr. Seuss. The most indelible image, though, is another massive parade: one that happens about halfway through the production. The three-dozen-strong company walks in a line across the stage, carrying weird cardboard cutouts above their heads. The objects themselves are loops and tangles whose shapes become understandable only when we see their shadows on the back wall. The company carries airplanes, faces, gas masks, ships—all the heavy load that exploitation requires. It’s rare that you leave an exhilarating production feeling more burdened than you did when you went in. But this time we walk out under our own shadows, and for once, by heaven, we feel the weight. Park Avenue Armory (Off Broadway). 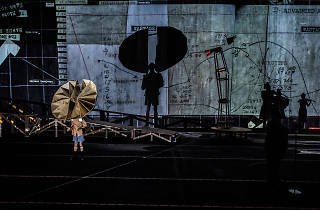 Conceived and directed by William Kentridge. Composed by Philip Miller and Thuthuka Sibisi. Running time: 1hr 30mins. No intermission.